Today is Friday and the first day of the blessed month of Ramadan thus making it a day of countless blessings. The Holy Prophet (peace and blessings of Allah be on him) said that there is an hour on Friday when whatever a true believer supplicates gains acceptance by God. And he told us about Ramadan that during this month doors to Paradise are opened while doors to Hell are shut. God’s grace and mercy is particularly stirred in Ramadan and true believers are showered with blessings. Indeed the Holy Prophet (peace and blessings of Allah be on him) said there are some conditions to attract God’s grace. One should shun idle, vulgar matters and chaos, eschew using abusive language and getting involved in altercations and should respond to all evil with: I am fasting and I am eschewing all this for the sake of God. This would make one fast in the true spirit. God has tied the significance of Ramadan with acceptance of prayer in the following verse: ‘And when My servants ask thee about Me, say: ‘I am near. I answer the prayer of the supplicant when he prays to Me. So they should hearken to Me and believe in Me, that they may follow the right way.’ (2:187). Thus stressing the blessedness of Ramadan by placing this verse directly after the verse regarding Ramadan and tying in acceptance of prayer with fasting during the holy month. Fridays during Ramadan are of enhanced significance but God has not pinpointed the hour during Friday when supplications gain acceptance, thus emphasising that supplications should be made night and day. Generally speaking during Ramadan God puts Satan in fetters, opens doors to Paradise and comes closer to man. On top of this, Fridays during Ramadan should be fully availed of. The main prayer of a believer should be made with humility to be included among those whose prayers of night and day are accepted all the time and not only in Ramadan; so that one may be permanently guided. The verses preceding 2:187 state that earlier people also fasted, but this is not the impetus for fasting. The impetus for fasting is to adopt righteousness and avoid spiritual and moral weaknesses. 2:187 states: ‘…may follow the right way.’ This signifies having correct morals and maturity of senses on a permanent basis. Ramadan is a month of countless blessings but these blessings are given to those who follow the commandments of God and enhance in faith. If one only offers Friday Prayers during Ramadan and does not carry on afterwards, one is not abiding by God’s commandment and has weakness of faith. How can one go on to complain that one’s prayers are not answered! Those who are restless to come in the refuge of God need to spend their time praying with extreme humbleness and humility by acknowledging their shortcomings. Some people assume that God comes closer to man during Ramadan so praying during this month is sufficient. This is a misleading thought. One should seek God’s closeness with complete and utter humility. Indeed, God is Ever-Present but man can only gain nearness to God when he abandons all else except God and turns only to Him with humility. It should be understood very well that the objective can only be attained with righteousness and piety leading us to enjoy personal as well as communal fruits of success that God has destined. Man does wrong and man sins but as long as he has fear of God and acknowledges his wrongs and has righteousness, God covers his sins and wrongs and ultimately enables him to repent. We should pray during Ramadan for ourselves, our near and dear ones and for members of the Jama’at that may everyone attain righteousness and fear of God. If we pray for each other with compassion angels will join in our prayers. What is righteousness? It is fear of God and as long as we have righteousness God will cover our shortcomings and our sins unless we become so audacious that fear of God leaves us when committing sin! If weakness leads us to sin but is followed by fear of God, God forgives us. Fear of God is love of God and as long as we have it we will be saved from ruination. Indeed, it is conditional that this love is true love. God knows what is in hearts and none can deceive Him. Thus, owing to God’s love if we stumble and then pick ourselves up and follow His commandments, God keeps His sense of honour for our love for Him and does not let us go to waste and enables us to repent. However, if man discards the very essence of righteousness and rejects it, he is punished. We are most fortunate that we accepted the Promised Messiah (on whom be peace) who repeatedly told us to abide us by righteousness. 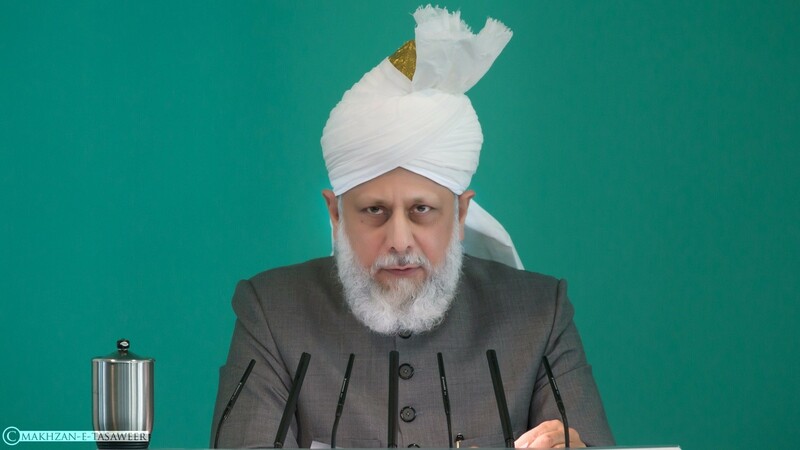 After him we have been given a spiritual system [of Khilafat] which reminds us time and again regarding the essence of righteousness. Indeed, Ramadan too comes each year to nourish and sustain this essence. Everyone should try and avail the beneficence of this sacred month and become servant of God. If due to our shortcomings and failings God delays acceptance of our prayers it is like when a mother momentarily shows her displeasure in order to correct her child. But when the child realises his fault and goes to the mother, she embraces him. Indeed, God’s love is greater than mother love. He is ever looking out for man to repent so that God may forgive him. The Holy Prophet (peace and blessings of Allah be on him) said that man’s repentance pleases God more than a person who finds his lost she-camel in wilderness. If man turns to God with the intention to repent during Ramadan, God runs to that person. The Holy Prophet (peace and blessings of Allah be on him) said God says if man comes one span nearer to Me, I go one yard closer to him and if he comes one hand span closer to Me, I go a distance of two hand spans and if he comes to Me walking, I go to him running. Thus if man does not avail of so many ways and means that God has put in place to seek His pleasure then it is nothing but man’s own hard-heartedness. We cannot imagine or indeed explain the love God has for us. Indeed the aforementioned hadith creates a most excellent concept of God’s love, yet it not possible for us to really encompass God’s love. Our knowledge is weak and limited; we cannot even know what is in hearts of other people. Describing this Hazrat Musleh Maud (may Allah be pleased with him) said we cannot even understand the works of God, how could we understand His love! The Holy Prophet (peace and blessings of Allah be on him) tried to explain God’s love to us through examples and analogies. When the enemy was completely defeated in the Battle of Badr and prominent and daring disbelievers were whipping their mounts to retreat from the frontline a woman was found fearlessly going around the battlefield. She would pick up any child she saw and then put it down. The Holy Prophet (peace and blessings of Allah be on him) said, this woman has lost her child. Mother love was so overwhelming that she had no fear of being in the middle of destruction filled battlefield and hugged every child she saw and then let go realising it was not hers. Eventually the woman found her child, she embraced him and with complete abandon sat down with him with no thought of the dangers around her or indeed the dead bodies and the fact that battle had not quite ceased. The Holy Prophet (peace and blessings of Allah be on him) said, you see with such satisfaction she sat down once she found her child while beforehand she was extremely anxious. It is the same with God and His love for man. God is as grieved as the mother of the missing child when a person is lost due to his mistakes or sins. And when that person repents and returns to God, God is happier than the woman who found her lost child. Our God is always ready to forgive providing we are also ready to be forgiven. Any negligence is on our part. God’s forgiveness covers the person who turns to God and seeks forgiveness for his sins. Hazrat Musleh Maud (may Allah be pleased with him) said not only God’s forgiveness covers one’s sins but it also forgets the sin/wrongdoing and makes people forget it too. This is why one of God’s name is Sattar (Coverer of faults). This Divine attribute signifies an intense quality to cover other’s faults. People can cover faults and sins of others but they cannot make people forget them whereas God can remove the memory of sins committed by people from the minds of others. If God was not Sattar man would not even have peace in Paradise. Our God not only covers our faults He also effaces our sins and restores our respect. How much sacrifice should we be making to go to such a Loving God, to become His servant and indeed to run to Him! Satan waylays at every corner but we will contend with him and fail his every attack by coming into God’s refuge. Becoming a true servant of God will be truly availing the blessed month of Ramadan. It will benefit us on a personal as well as communal level. Progress of members of Jama’at translates into progress of Jama’at. We know that the Promised Messiah (on whom be peace) said his progress and triumph was through prayers. Thus we should turn to God and seek progress of our Jama’at and pray fervently during these days. We should not limit our prayers to ourselves and our near and dear ones. Rather we need to intensively widen the scope of our prayers, then alone will we be paying the dues of being part of the Jama’at of the Promised Messiah (on whom be peace) and we should be grateful to the favour of God of including us in the Jama’at. God has placed a huge responsibility on us as Ahmadis for which the Promised Messiah (on whom be peace) drew attention of his Jama’at to prayers. We are indeed humble and weak and acknowledge our incompetence. However, we are the people on whom God has placed the responsibility to attain a magnificent objective which is not possible without His grace. In this regard Hazrat Musleh Maud (may Allah be pleased with him) said if we are in fact weak and the task assigned to us is very difficult then how can we do this task? This task requires a lot of power to bring it to completion while we are weak. It will have to be acknowledged that either we are not that weak or this task is not as difficult as it is claimed. Or if both these statements are correct and we are weak and this task is difficult then it will have to be acknowledged that besides our efforts God has put other sources in place for the task to be completed. It is God Who is going to fulfil the objective and Islam Ahmadiyyat is going to triumph in any which way, there is no doubt whatsoever in this. And for the attainment of this God has taught us the means of prayer. Our task will not come to completion through our efforts alone although in obedience with God’s will we are ever ready for sacrifice. We pray to God that with His grace He helps us through His hidden sources which He has willed. The fact is that God has made us the apparent source whereas the real source which will bring about triumph is something else. However, we should have a certain heart-felt passion for the triumph if Islam which should manifest in the form of prayers. 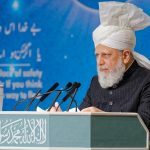 Hazrat Musleh Maud (may Allah be pleased with him) said an analogy of our situation can be drawn to when during the Battle of Badr the Holy Prophet (peace and blessings of Allah be on him) threw a handful of pebbles at the enemy but God stated that what followed was not due to his throwing pebbles rather it was from God that a fierce wind started which blew off millions of pebbles from the ground in the eyes of the disbelievers. That is, behind the handful of pebbles thrown by the Holy Prophet (peace and blessings of Allah be on him) was working God’s power. We too are like the pebbles of Badr, the pebbles which the fierce wind blew off blinding the disbelievers. We have to acknowledge that God has put other arrangements in place to bring about the triumph of Islam and those arrangements are prayers of God’s servants which attract God’s grace and turn the impossible into the possible. The Promised Messiah (on whom be peace) said indeed this is what our success depends upon. We should especially pray a lot during these days of Ramadan for the triumph of Islam. May we become like the handful of pebbles of Badr. May God overlook our negligence and mistakes and make such arrangements that we attain our objective. May our negligence never be a source of joy for others and with His grace, may God strengthen our weak hands to do the task that needs doing. Prayers should be made for oneself, for each other and for the progress of Jama’at and for the enemy to fail and lose out and for the manifestation of God’s majesty and glory! The world is fast denying the existence of God, may it recognise God. May God forgive our mistakes and instil such strength within us availing which we can make Islam triumphant over all other world religions. May each one of us become a sincere servant of Islam and may worldly desires become secondary for us. May our hearts be effusive to uphold faith and to utilise all our capacities for this purpose. May God so strengthen our actions and our capacities that the enemy’s strength is disgraced by comparison! Not only may God forgive our faults but also instil abhorrence for sin in our hearts and may we never break His commandments and be included among those who abide by His commandments and perfect their faith! May we love piety and everything good and may righteousness be instilled in us firmly! May love and ardour of God become our sustenance and may our every word and deed be in accordance with God’s pleasure and when we present ourselves before Him, may He grant us His pleasure. May God make us truly attain all of this during this Ramadan!